The Sheraton Houston West Hotel welcomes you to the West Houston area with a friendly smile and great comfort and service. 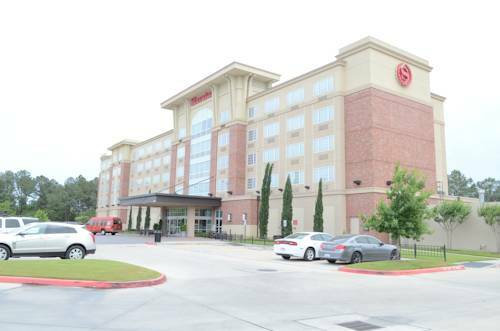 Conveniently located on Clay Road, just east of Beltway 8 and between Interstate 10 and U.S. Highway 290, our hotel is close to a wide variety of business parks, the Energy Corridor, and Memorial City. Our hotel is 24 miles southwest of George Bush Intercontinental Airport (IAH) and 27 miles northwest of William P. Hobby Airport (HOU). Baseball USA is only three miles away.Designed for your comfort, all 158 guest rooms feature the indulgent Sheraton Signature Sleep Experience in a choice of one king or two double beds, as well as High Speed Internet Access to keep you connected to friends and family back home. Feel free to surf the web on our computer workstations or bring your laptop for wireless High Speed Internet Access in the lobby. Make time for a stellar workout at Sheraton Fitness to keep you energized while youre on the go.There are plenty of opportunities for recreation and relaxation. Exercise in the fitness center or cool off in the outdoor pool. Catch a quick breakfast or enjoy lunch or dinner in our full-service restaurant. Kick back with your favorite beverage in the lounge, or order from room service. You can also take advantage of our free shuttle service within a five-mile radius to area corporate offices, restaurants, and Memorial City Mall.Groups, meetings, conferences, and weddings are also welcome. Our hotel offers three distinctive function rooms, ranging from the intimate to over 1,000 square feet of space for meetings and banquets of up to 80 people. Professional audiovisual services, High Speed Internet Access, and catering are also available.Sheraton Houston West Hotel has everything for the corporate, leisure, and group traveler. Take care of business, or get down to the business of relaxing. We look forward to sharing the experience with you. Were located in Memorial City, so the entertainment and dining options when you stay with us at the Sheraton Houston West are endless! Go ahead and explore. Memorial City Mall features over 150 shops, an NHL-sized ice skating arena, and over 30 different dining options.Our hotel is also next to Houstons Energy Corridor and the Westchase District, which is home to multi-national and local energy companies such as ConocoPhillips, BP America, Shell Exploration and Production, and ExxonMobil.Non-energy companies including Cardinal Health Care Inc., Sysco Foods, Accenture, The Dow Chemical Company, BMC Software and Jacobs Engineering are also nearby. Join us for classic American dishes, steak, pasta, and fresh seafood. Our restaurant is now open for breakfast, lunch and dinner seven days a week, and also provides an in-room dining menu.